ClubCoins Benodigd: 44 Please note that, for now, you cannot download content from our platform directly onto a mobile device (phone, iPod, iPad, tablets...). You need to download your items onto a PC or Mac, and then transfer them onto your device in the normal way. We are working on allowing direct downloads to mobile devices but this is not possible in the current version of the platform. Sorry about the inconvenience! NOTICE: Requires the base game Northgard in order to play. Activation key must be used on a valid Steam account. Requires internet connection. About the gameThe Clan of the Snake, gathers some of the most roguish vikings to set foot on the continent of Northgard. Led by Signy, the Spear Maiden, the cunning members of the clan have little regard for fame or honour and would rather use guerilla… tactics to dominate their enemies than open warfare.The clan’s warchief is available at the beginning of the game and, while her martial skills are slightly better than a Warrior’s at first, she will grow as seasons go by, becoming more powerful and unlocking new abilities in the process. Her most powerful skill, “Scorched Earth”, can only be unlocked once Signy becomes an adult, and will allow her to burn down a tile, providing attack bonuses to her units and buildings.The Clan’s unique conception of war translates into specific Knowledge such as “Guerilla Tactics”, giving bonus attack power to the Snake’s warriors when killing civilians, or “Stolen Lore”, allowing players to steal Knowledge from another clan. 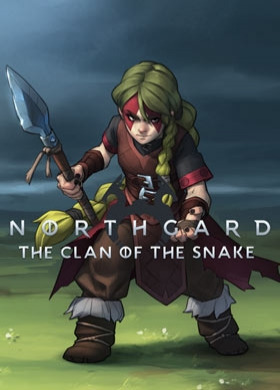 Key Features Experience a brand new way of playing Northgard: the Clan of the Snake has no Honor, and thus, cannot win a Fame Victory! But do not underestimate its potential... Backstab your opponents, steal their Knowledge, and create new and innovative tactics Travel accross Northgard without fear as Signy and her Skirmishers can hide themselves among wild Wolves and Bears! Use your Black Markets to bolster your economy without helping your opponents! Cripple the other player's economy by using Scorched Earth, Signy's special ability and boost your unit's attack power System Requirements Windows - Minimum OS: Windows Vista or better Processor: Intel 2.0ghz Core 2 Duo or equivalent Memory: 1 GB RAM Graphics: Nvidia 450 GTS / Radeon HD 5750 or better Storage: 400 MB available space Windows - Recommended OS: Windows 7 or better Processor: Intel i5 3.1 Ghz Quad core Graphics: Nvidia GTX 660 / Radeon HD 7800 or better Storage: 400 MB available space Mac - Minimum OS: Mavericks 10.9 or later Additional Notes: MacBook, MacBook Pro or iMac 2012 or later Linux - Minimum Processor: Intel 2.0ghz Core 2 Duo or equivalent Linux - Recommended Processor: Intel i5 3.1 Ghz Quad core © 2016 Shiro Games. The Shiro Games name and logo and the Northgard name and logo are trademarks of Shiro Games and may be registered trademarks in certain countries. All rights reserved.